In the past we’ve had loads of bands asking us to help them earn money by placing their music in TV shows, movies and in games. In response to this we’ve now launched SupaSonic. A completely artist friendly Sync, Licencing and Publishing division based around our own technology that allows media producers from around the world to listen to and buy your music for their TV shows, movies or games. 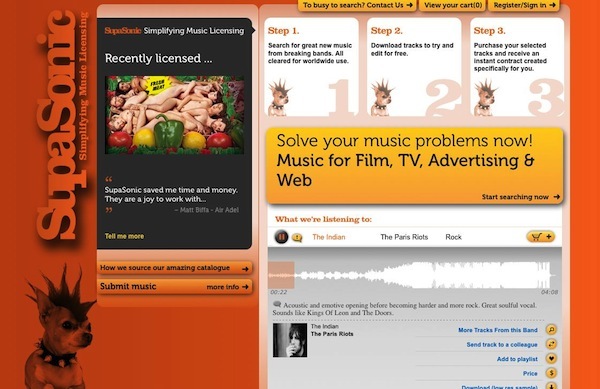 SupaSonic’s sole aim is to keep the artists in control, yet allow them to directly reach the people who want to buy their music. We’ve already placed SupaSonic artists in twelve of Channel Four’s iconic Fresh Meat TV series, in a number of movie soundtracks as well as international TV Channel launches. But that’s not all - Sony Pictures Entertainment in Los Angeles want to use the SupaSonic catalogue for all their TV shows made around the world and David Barron (the Harry Potter Producer) and LionsGate Motion Pictures in Hollywood want exclusive peeks at the best music. Here at SupaJam we get really excited on where we can end up placing the best SupaJam bands and artists. If you would like us to consider you for inclusion in SupaJam’s SupaSonic catalogue please email davidc@supajam.com and we’ll get back to you straight away.